By Zoe Huang. Note: Africa-China Reporting Project alumni and China House founder Huang Hongxiang led a training session at the Project’s recent Africa-China Reporting Workshop. In November Hongxiang and his colleague Zoe Huang undertook a month-long campaign in South Africa’s Chinese communities on the rhino horn trade. Despite Vietnam being the largest rhino horn market in the world, when it comes to rhino poaching and rhino horn trade in South Africa, China remains the top villain in people’s minds. In 2017, after the controversial rhino horn trade legalisation, South African private rhino farmers put up a Chinese website to market their “products” to Chinese people – especially to the over 300,000 Chinese nationals in South Africa. However, Chinese communities in South Africa are working to break this impression. “We always see news that ‘Chinese are arrested with rhino horns’ and we feel embarrassed. Our names are jeopardised by a small percentage of Chinese. The majority of us, in fact, the most of us, would not buy rhino horn,” says Jack, community leader of the Cyrildene Chinese community in Johannesburg. Chinese community members in front of the pledge in Johannesburg at the beginning of the campaign. From the beginning of November, a one-month campaign was carried out by China House, an NGO that tries to help Chinese communities integrate into Africa’s sustainable development, to mobilise members of the Chinese community in South Africa to speak up against the rhino horn trade. Posters were put up in Chinese restaurants, supermarkets, malls and so on to spread information in Chinese about why the rhino horn trade should not be legalised, also including the declaration “We will not buy” in English. 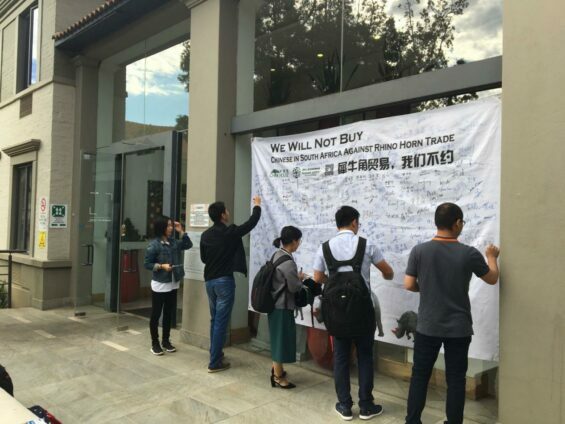 A large banner signing pledge was moved from one community center to another in Johannesburg and Cape Town to collect signatures of Chinese people who commit never to buy rhino horn no matter it being legal or not. International wildlife conservation NGOs such as Humane Society International support this initiative within the Chinese communities. So far over 2,000 signatures have been collected from Chinese employees in big companies like Huawei to small Chinese traders in Cyrildene over a dozens of activity locations in Johannesburg and Cape Town. 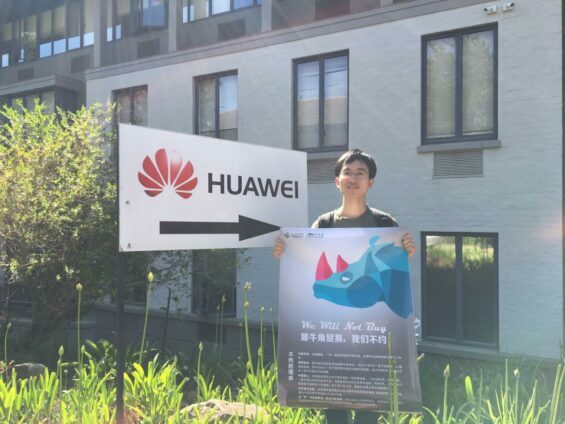 Huang Hongxiang with the poster at the Huawei compound in Johannesburg. “We would not buy anyway,” said most of the Chinese community members who saw this pledge and sign. “It is the Vietnamese who buy!” Many Chinese feel innocent and angry when the rhino horn trade and bad name of Chinese in South Africa are mentioned. “Growing up in South Africa, we know how bad this rhino horn trade damages the image of us Chinese people. A campaign like this should have be done earlier,” says Lisa Deng, daughter of one Chinese restaurant owner in Rivonia, Johannesburg. She grew up in South Africa and has always kept telling her local friends that not all Chinese eat dogs and buy rhino horns. 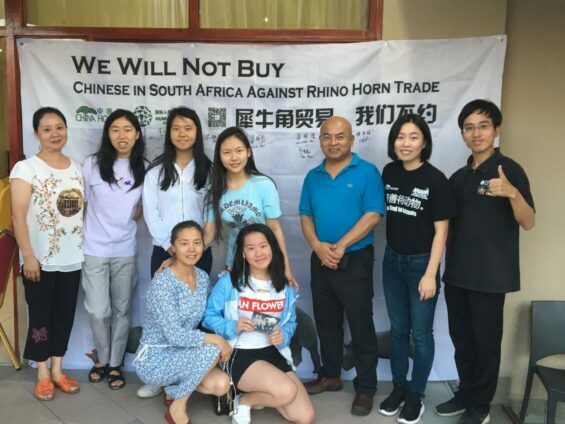 “We need to let Africans know the Chinese communities in South Africa are also against the rhino horn trade,” says Yang Yu, community leader of the Chinese community in Rivonia, who jointly initiated the campaign with China House. As with many other Chinese community leaders in South Africa, he understands how the bad reputation in wildlife conservation could jeopardise the future of Belt and Road Initiatives and many business partnerships. Huawei employees singing the pledge at the end of November. “Based on our research, we know that because of lack of engagement the Chinese communities in South Africa know very little about wildlife conservation and rarely get involved. However, if you know the right way to engage them, you would realise a lot of them could be as passionate in protecting wildlife as international conservationists” says Huang Hongxiang, the founder of China House and the Chinese conservationist featured in the Netflix documentary the Ivory Game. “When we first arrived South Africa few years ago, Chinese community members in South Africa told us they never participated in any wildlife conservation NGO activities and in fact never interacted with them”. Huang recalls how shocking it was to realise the gap between Chinese communities in Africa and wildlife conservation NGOs, given that the Chinese in Africa are key stakeholders in many wildlife conservation topics. The pledge catches a lot of attention during dinner time outside a Chinese restaurant in Johannesburg. 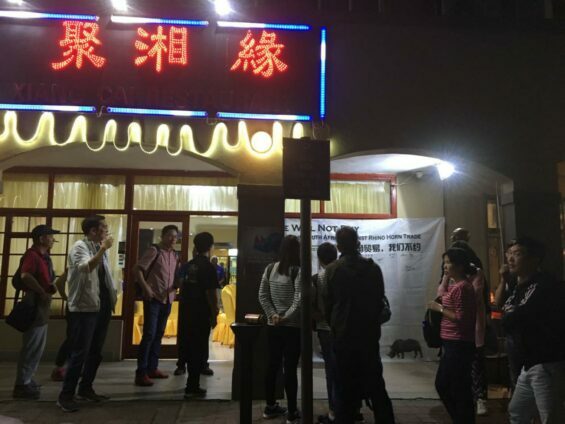 “Compared to last year, nowadays we do not need to explain much to Chinese community members about who we are and why we are doing things like this. They now have a clearer concept about wildlife conservation and why they should participate and help”. Huang Hongxiang is an environmental journalist with wide experience reporting from Africa; he has written for the Mail & Guardian, Southern Weekly 南方周末 and The Atlantic, among others. In 2013 Hongxiang spent three months on an environmental journalism fellowship in collaboration with the Africa-China Reporting Project and the Oxpeckers Centre for Environmental Investigative Reporting. He travelled through southern Africa to explore Chinese connections to wildlife trafficking, and produced several features including Rhino horn trade thrives in Jo’burg in the Mail & Guardian in which he outlined the role Chinese nationals and interests are playing in the illegal ivory trade in South Africa. Hongxiang’s feature ignited extensive debate on the topic and elicited a direct rejoinder from the Chinese Embassy in Pretoria, likewise published in the Mail & Guardian as Letter to the editor: M&G rhino article misleading. After the feature was published, Hongxiang was invited to discuss the matter with Chinese Embassy officials, seeking ways to address the smuggling. Subsequently Hongxiang set up China House, a Nairobi-based NGO and partner of the Africa-China Reporting Project, to help Chinese people better integrate in Africa. His recent published articles include Spotlight on Zambezi’s ivory smuggling (2014); Chinese ivory smugglers in Africa (2015); and Chinese journalists in Africa: Bridging the communication gap (2016).